Living in America as I do where we have the great blessing of religious freedom, it’s amazing to me to think of the life of the Renaissance composer William Byrd (1543 – 1623). He was a Catholic, a contemporary of William Shakespeare (1564 – 1616), living in post-Reformation England under the patronage of Queen Elizabeth. It was because of her patronage and that of others who admired Byrd’s work, that he was able to avoid the dangers of being a Catholic in England during this time and to hold several prestigious posts including organist at Lincoln Cathedral and at the Chapel Royal along side his teacher Thomas Tallis (1505 – 1585). Queen Elizabeth herself was a musician and gave these two rights to publish music in England. Byrd’s music demonstrates the ability he had to write in the ancient, polyphonic manner so often found in Catholic sacred music, and also to adapt to the new needs of the Anglican church services and to writing music in praise of the Queen. This adaptability is a characteristic which would show up again in the music of the great English composer Henry Purcell (1659 – 1695) for the same sort of reason since he also was the organist for the Chapel Royal during a turbulent time in England’s history. In the case of both Byrd and Purcell, religious and social challenges lead to a flowering of creative genius. One might say that listening to Byrd’s Catholic music, one can hear a deep sense of longing and close connection to Christ’s suffering and persecution. One can also hear the connection to composers of the past in the up and down weaving of the melodic lines. It’s amazing to think that Byrd’s Masses were sung undercover because it was dangerous to attend Mass in England at this time. His consort music in the English language is of a different character, light and flowing, joyous and, if I may say so, very “English”. An admirable person who turned both adversity and good fortune into motivation for creative genius, William Byrd is a composer worthy of our attention. 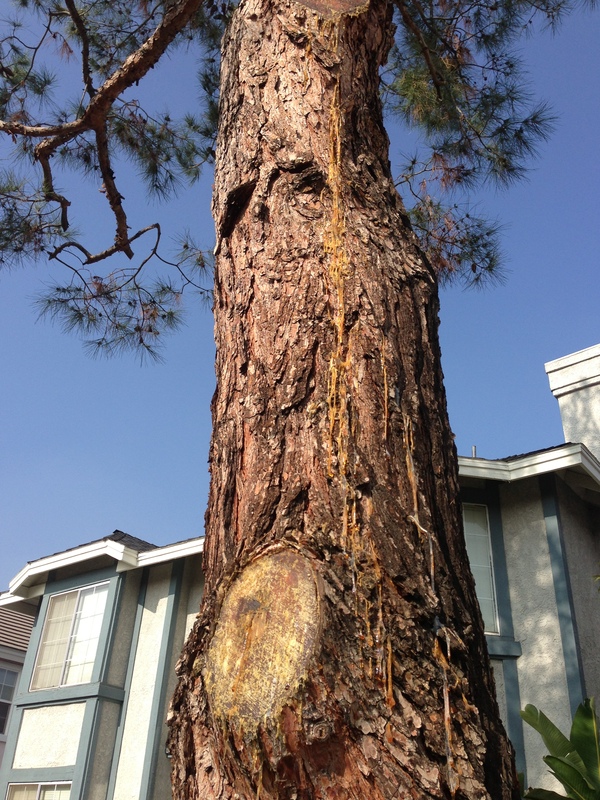 I was out walking today and happened upon a pine tree with sap oozing out from freshly-cut branches. 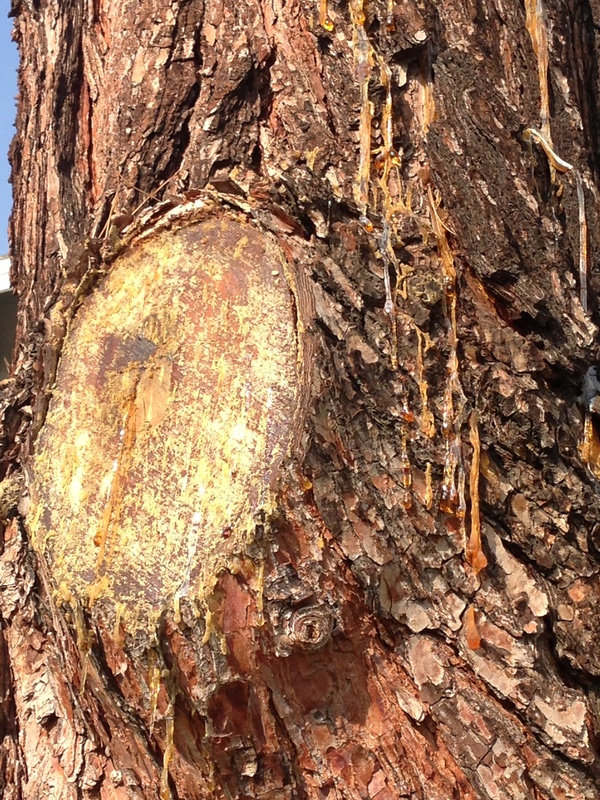 When teaching I’m often asked where the rosin comes from that we use on the violin bow. Well, here is a great image of where the basic ingredient comes from, yet another example of how many of the materials we use to make music come directly from nature. As we’re gearing up for a new orchestra season for LVSO, I’m getting to listen to movie score after movie score to work on deciding what we’ll be playing this coming spring. It’s an enjoyable task. We’re looking into music from Lord of the Rings, Pirates of the Caribbean, Amadeus, Fiddler on the Roof, Pride and Prejudice, to name a few. If you’re in the area and are interested in joining, we start rehearsals on Thursday, February 5, 4:30 – 7:00 in Morgan Auditorium at the University of La Verne. For more info, you can read about LVSO on our page at daniellerosariaviolinist.com/lvso.